Shoes stinky? 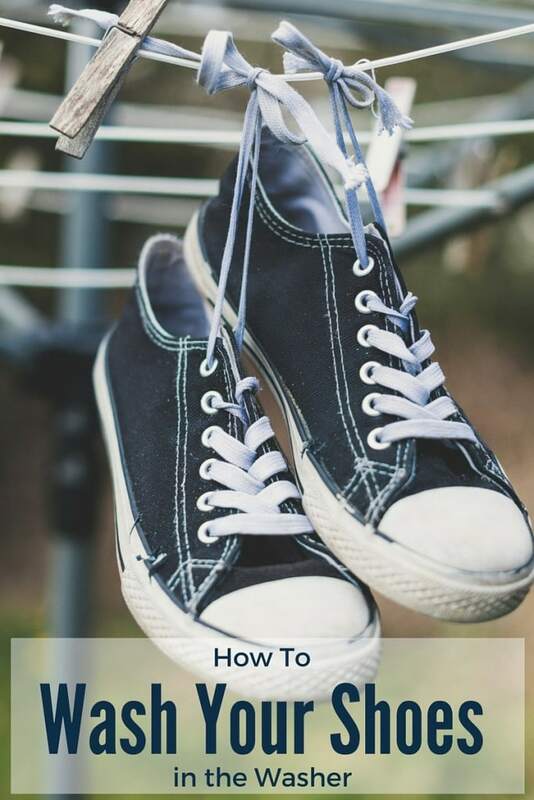 Continue reading to find out how to wash your shoes in the washer. My husband has been complaining about how his shoes stink. Yes, he even made me smell them to make sure it wasn’t just him. They stunk, so it was time to give them a good washing. Please note: This guide is for tennis shoes, cloth type. Not for leather or dress shoes. Before beginning, double check instructions for cleaning your shoes for what you should and should not do. Thought about making your own cleaning supplies? Take a look at these cleaning ideas! Before putting your shoes in the washer, remove the laces. Place the laces in a mesh laundry bag or a pillowcase. Also, if the insoles come out of your shoes, remove those. Keep reading for the instructions on washing the insoles. First, remove as much of the dirt and debris from your shoes. This will keep all of the gunk out of your washer. Place your shoes in the washer with a couple of old towels and the bag with your shoelaces. The towels will help to balance your washer and tone down any clunking. It is recommended to use liquid detergent. I have both and actually used the powder the last time. The concern is the possibility of power detergent not fully dissolving and some staying inside the shoe. Just know if you use powder, this could happen. Place your washer on a delicate cycle with cold water and start the wash cycle. Like I mentioned before, not all insoles come out of shoes. We washed 2 pairs of my husband’s shoes. One had removable insoles and the other one didn’t. In the bathroom sink, fill with slightly warm water and mix in a small amount of liquid detergent. Using a rag or sponge, scrub the dirt and stains from your insoles. Make sure to fully rinse out your insoles so no soap residue is left behind. Use a dry sponge to help remove water from your insoles. Layout to dry. I highly suggest letting your shoes air dry. However, if you don’t have the time to wait, you can place your shoes in the dryer. I suggest using the dryer rack that came with your dryer to set them on. This will eliminate the clunking. Just dry the towels in another session if you use the rack. If you don’t have a dryer rack, you may want to dry the towels with your shoes to reduce clunking. If you use the dryer, make sure to use low heat. The bottoms of your shoes are most likely rubber so they heat of the dryer can misshape them. This is why I suggest air drying instead. Once the shoes are dried, replace the insoles (if needed) and laces. After my husband’s shoes were done, they came out smelling so much better! No more stinky shoes. Please remember, this is a general washing technique for cloth tennis shoes. Make sure to check and see if there are any washing instructions for your shoes before trying this method.